ArcticDefinitions of the Arctic vary according to environmental, geographical, political, cultural and scientific perspectives. Some scientists define the Arctic as areas having a high latitude, long winters, short, cool summers,... More Monitoring and Assessment Programme. One of the working groups of the Arctic Council. Established in 1991. AMAPArctic Monitoring and Assessment Programme. One of the working groups of the Arctic Council. Established in 1991. AMAP is responsible for measuring the levels of pollutants in the Arctic, and... More is responsible for measuring the levels of pollutants in the Arctic, and assessing their effects on the environment and people. AMAP also documents trends of pollution and the sources and pathways of pollutants. It examines the impact of pollution on Arctic floraThe plants that live in a particular region, habitat or time (such as geological period like the jurassic). For animals, we use the term fauna, and to collectively refer to all... More and faunaThe animals that live in a particular region, habitat or time (such as geological period like the jurassic). For plants, we use the term flora, and to collectively refer to all... More, especially those used by indigenousBelonging to a certain place. Indigenous people are distinct ethnic groups that have historic connections to people who lived in a territory prior to the area being colonized or coming... More people. It reports on the state of the Arctic environment and gives advice to governments on priority actions needed to improve the Arctic condition. Early reports from AMAP led to the establishment of the Arctic Council Action Plan to Eliminate Pollution of the Arctic (ACAPArctic Contaminants Action Program. One of the working groups of the Arctic Council, formally established in 2006. The goal of ACAP is to reduce emissions of pollutants into the environment... More). A further follow-up to AMAP was the Arctic ClimateThe average weather we would expect over a long period of time (seasons, years, decades). Climate varies from place-to-place across the Earth. Climate is determined by long-term (over at least... More Impacts Assessment (ACIAArctic Climate Impact Assessment. A collaborative project of the Arctic Council and IASC. 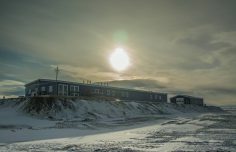 Started in 2000, the aim is to gather and assess knowledge about climate variability, climate change and increased ultraviolet radiation in the Arctic.... More).